The prospect of going back to work after a month of frolicking in the sun and sea is not one that I enjoy . . . a scenario that calls for chocolate and nourishing goodness to push me through those first few afternoons at work. These scrumptious little truffle balls are just perfect for an afternoon treat. They are chocolatey with just a hint of saltiness and a melt-in-your mouth texture. For a true energy hit use protein powder as I suggested, or if you prefer, coconut flour works just as well. I’ve banged on before about The Naked Co protein powder, and for good reason – organically flavoured, no fillers/artificial colours/flavours, free from hormones, chemicals antibiotics and gmo – this stuff is the shiz. In a food processor combine all the ingredients (except the desiccated coconut and cacao nibs) and blend on high until a smooth runny paste is formed, much like the consistency of nut butter – this may take a couple of minutes depending on your food processor. Pour mixture into a tray and place in the freezer until firm (approx 15mins). 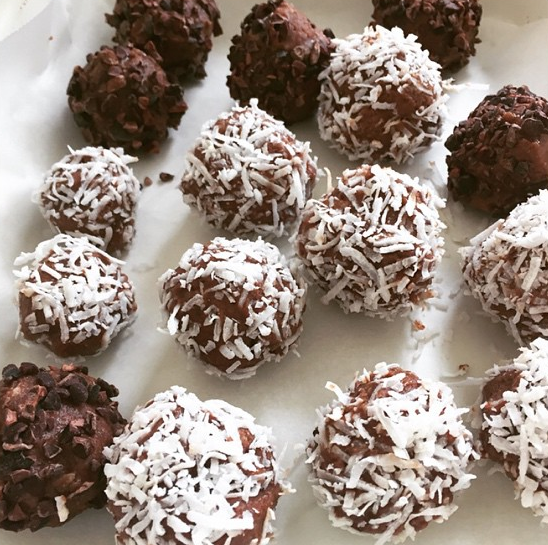 Take out mixture and spoon out heaped teaspoons, rolling into a ball and coating in desiccated coconut or cacao nibs – you might need to do this step quickly if it’s a warm day as the coconut oil may begin to melt. Freeze the balls until hard and then keep in the fridge or freezer depending on how cold/hard you like them.